In this episode I share some thoughts about how to get involved in the end-of-life movement if you have recently become interested in death and dying. You’ll hear about my best ideas for contributing to change in the way people die and offering your service to others. Check out my book to read stories about hospice patients I cared for. Welcome to our new sponsor: Authentic Presence Training from the Spiritual Care Program. Authentic Presence brings together practical contemplative resources with the knowledge and skills of modern hospice and palliative care. Suitable for professionals from all faith traditions or none, the course draws its inspiration particularly from Buddhist contemplative practice, the acclaimed classic The Tibetan Book of Living and Dying, the work of the Dalai Lama, as well as contemplative neuroscience. Learn more here. Thank you also to our new supporter on Patreon.com/eolu: Althea Halchuk! I’m deeply appreciative of your contribution to help keep this podcast and the EOL University Interview Series on the air! Go to Patreon.com/eolu to learn more and sign up. Join me and my guest Suzanne O’Brien RN for a free webinar: “EOL Doula Training for Caregivers and Volunteers” on Tuesday July 24th at 5 pm Pacific/8 pm Eastern. Register here and you’ll receive the replay if you can’t attend live. No One Dies Alone – a program to ensure that each dying patient in the hospital has companionship if desired at the end of life. Listen to my interview here and learn more about NODA here. Threshold Choir – for those who love to sing; offer support and inspiration to the dying and their families through vocal music. Listen to my interview here and learn more about Threshold Choir here. Twilight Brigade – to provide end-of-life support to veterans. Learn more here. Pet Therapy for Hospice Patients – if you have a special pet and would like to receive training to provide visits to patients. Learn more in this interview. Become an End-of-Life Doula – check out the training mentioned above with Suzanne O’Brien and find out if this work is a good fit for you. Learn more here. Start a caregiver training program – the need for in-home caregivers is going to increase dramatically over the next decade. Consider becoming a caregiver trainer to help your community meet this need. Teach a death education class – there is currently a great need for education about death and dying in our society. Consider teaching your own class or workshop to provide information to others in your community. Get the Teaching Guidelines for a Death & Dying Class here. Start a Social Model Hospice – to provide non-medical residential support and caregiving for those who are without a proper home at the end of life. Listen to the interview here. Whatever inspires you I hope you will gather your courage and take the next step to get involved in the end-of-life movement. Your help is needed! There will be a new episode next Monday. If you enjoy this content please share it with others and consider leaving a review on iTunes. Thank you for your interest and support! Learn about the life of Cicely Saunders and what we can discover from her quest to change the way that people died. In this episode, recorded just after the celebration of what would have been Cicely Saunder’s 100th birthday, I talk about how she became interested in caring for the dying, what inspired her to create St. Christopher’s Hospice, and what we can learn from her determination to improve care at the end of life. Thanks as always to my devoted supporters at Patreon.com/eolu who make small contributions each month to keep this podcast and the End-of-Life University Interview Series on the air. I’m so grateful for your financial, emotional and spiritual support! If you’d like to join A Year of Reading Dangerously, our online reading group for 2018, there’s still time! Check out the reading list here and start reading along with 1,000 other people around the globe! Cicely Saunders first began working with dying patients when she was training to be a nurse in the early 1940’s in London. She went on to become an Almoner (medical social worker) and a volunteer nurse at a hospice for the dying poor where she recognized the great need for better pain management and comfort care at the end of life. When she was told that the medical system would not be interested in her ideas because she wasn’t a physician she accepted the challenge and went to medical school. 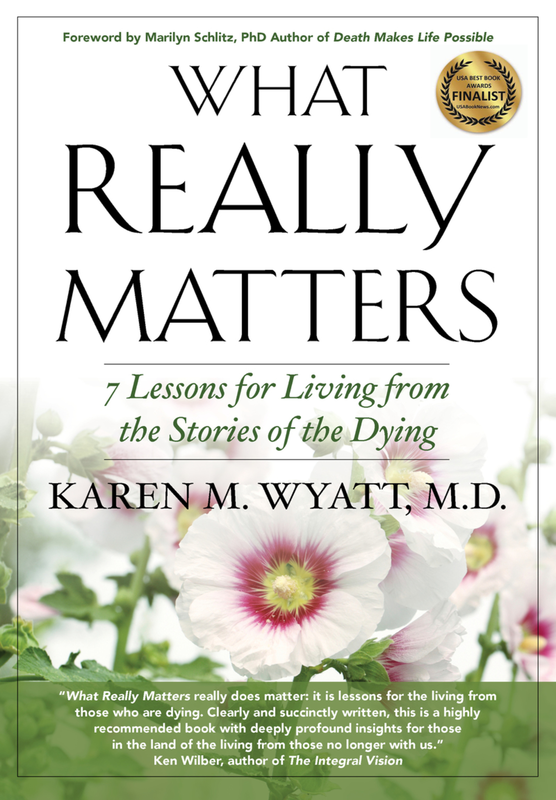 One revolutionary contribution to end-of-life care was her concept of “Total Pain,” which included emotional and spiritual pain as well as physical. As a doctor Cicely received a research grant where she studied pain management and wrote many articles. She took “before and after” photos of each patient so that she could show the transformation that occurred when pain was alleviated. Eventually her dream of creating a hospital dedicated to care of the dying was fulfilled when St. Christopher’s Hospice opened 10 years later. Follow your heart – Cicely stayed true to her heart and passion throughout her career as she dedicated herself to care of the dying, even when others discouraged her. Be willing to change course to achieve your dream – Cicely was unable to pursue her original dream of being a nurse after a back injury and shifted to medical social work as a way of continuing her work with dying patients. Be persistent – Cicely’s determination to do whatever it took to bring her dream to fruition led her to become a doctor. Patience is essential – Cicely had to wait for many years to see her dream of a hospice become a reality: first while she studied to be a doctor, then did several years of research, and finally raised the funds to build St. Christopher’s. Change rarely happens overnight so stay the course! The importance of teamwork – Cicely found likeminded individuals in her community and in the U.S. to sustain her inspiration and her enthusiasm for her goal. We can accomplish more as a team than as individuals. Flexible models are necessary for optimum care – Cicely resisted standardizing her model of hospice care and instead chose to help others create their own unique solutions for the needs of their communities. Have a big vision but humble expectations – Cicely sought to change care of the dying across the world with her vision of hospice but was content to make a difference to just one patient at at time. Today we would be advised to remember her Total Pain concept as we struggle to deal with an opioid crisis in the U.S. Neglecting the contribution of emotional and spiritual pain to physical pain has led to over-reliance on drugs as the answer to suffering. Happy Birthday Dame Cicely Saunders! Thank you for inspiring us to carry on your big vision of helping every person find comfort, peace and love at the end of life. Learn how small choirs around the country are bringing beauty and solace to the bedsides of dying patients. In this episode I share an interview with Kate Munger and Marti Mariette who have helped to spread the “threshold choir” movement across the U.S. and the world. You’ll hear clips of their beautiful singing! Learn more at www.thresholdchoir.org. I’m still traveling in Italy and you can keep track of my journey by following me on Instagram (kwyattmd) or Facebook (Karen Wyatt MD). I’m supposed to be getting some research and writing done for my new book on grief … but we’ll see how it goes. I might be just eating my way through the country! You can support this podcast and the EOLU Interview Series with a small donation of $1 or $2 per month! As a thank-you gift you’ll receive a the Top 10 Interviews from EOLU, a recorded Q&A session each month (where I’ll be answering YOUR questions), and a chance to have me promote your work on this podcast! Learn more at Patreon.com/eolu. Samples of some special Threshold Choir music! Get the Threshold Choir CDs here. Tune in each Monday for a new episode and be sure to leave a review on iTunes to help me share this podcast far and wide!